Despite large financial investments by governments and farmers, as well as significant inputs of time, effort and goodwill, the ecological, social and productive capacity of the Australian rural environment is under threat. The nature of environmental problems, the limited capacity of rural communities and government constraints pose immense challenges of governance. Traditional governance measures (ie those centred on public laws) and purely private and self-regulatory forms seem unable to meet these challenges. This has spurred interest in collaborative modes, with the hope of combining the best of both the public and private spheres. Collaborative experiments are already underway in rural Australia, but there is a need for more empirical examination of how such arrangements work in practice. The great hopes attached to the success of collaborative governance are mostly theoretical or based on applications that may not be relevant to rural natural resources in Australia. In the 1990s, Gunningham and others argued in favour of “smart” regulation as an alternative to command-and-control systems. As such, over the last three decades non-government organisations have entered the regulatory arena. A particularly successful contribution has been the initiation of public interest litigation (PIL), commenced under the auspices of the New South Wales Environmental Defenders Office (NSW EDO). Although smart regulation has been used to appraise the agricultural product sector and pollution, it has not been used to appraise planning and development regimes. This article evaluates the growth of PIL, focussing on the role of the NSW EDO. Initially, government acted in conformity with principles of smart regulation. However, as PIL became successful it challenged government in unexpected ways, leading to the introduction of conflicting policies and instruments that are inconsistent with smart regulatory frameworks. The resulting imbalance diminishes the viability of PIL and undermines one of the greater success stories of the environmental movement in Australia – and is arguably “unsmart” regulation. Through the lens of the current controversy surrounding the impact of a proposed dam on the Cliefden Caves in central-western New South Wales, this article highlights the need for environmental law and policy (and environmental lawyers) to pay greater attention to abiotic nature conservation and the protection of geoheritage in particular. It argues that existing environmental law in New South Wales provides inadequate protection for the State’s geoheritage, and in particular for the unique geoheritage of the Cliefden Caves and associated fossil deposits of international significance. This is contrasted with the Tasmanian experience, which highlights how greater protection of geoheritage can be achieved through a combination of legislation and effective, well-resourced policy implementation. Following Jacob v Save Beeliar Wetlands (Inc), environmental impact assessment (EIA) policy developed by the Environmental Protection Authority (EPA) of Western Australia has the status of a permissive relevant consideration. This decision has created an anomaly regarding the status of EIA policy. The EPA extensively develops and reviews its policy, and represents that it will use it in assessing proposals. Three case studies of liquefied natural gas proposals illustrate this fact to varying degrees. To ensure certainty of process, consistency and good decision-making in EIA, this anomaly must be resolved. The suggested view, supported by both legal and administrative reasons, is that EIA policy applicable to a proposal has the status of a mandatory relevant consideration. Potential solutions to the anomaly include amendments to the Environmental Protection Act 1986 (WA). 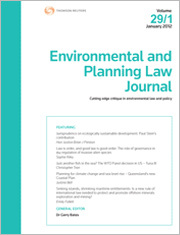 This article adds to the body of research concerning lawful and good administrative decision-making in the context of environmental regulation. The Paris Agreement encourages parties to enhance action to reduce forestry emissions. By reference to the experience of Australia and Indonesia, this article reveals significant challenges to reducing emissions from deforestation after the Paris Agreement. It evaluates the legal frameworks for regulating forest clearing in Australia and Indonesia, exposing several key barriers to their efficacy, and contends that, in order to reduce emissions from deforestation, regulatory clearing controls must be supported by payments to promote ongoing forest management. It is suggested that the delivery of such payments could be facilitated by legal frameworks that assign property rights to carbon. For the PDF version of the table of contents, click here: EPLJ Vol 34 No 4 Contents.